37. 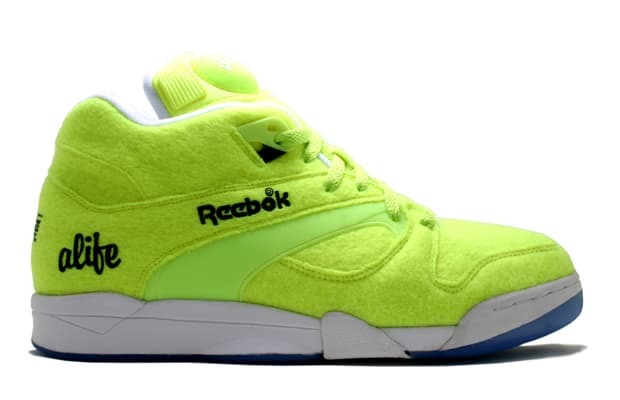 ALIFE x Reebok Court Victory Pump "Ball Out"
Everybody knows the best thing about the old Michael Chang Pumps was the neon pop color and tennis ball effect Pump valve on the tongue. ALIFE cranked that up a little for their 2005 'Ball Out' project and in doing so, created one of the decade's finest collaborations. These shoes aren't subtle, they're dirt magnets and they're too lurid to even attempt to downplay, but then again, Pump was never made to stay in the shadows. This is a big and bashy technology and a colorway that's probably visible from the moon, but the best sneakers are the ones that challenge the wearers. Some of the greats aren't for everyone.